Our Video Module supports both MP4 and MOV formats, but there are many different codecs (software algorithms for compressing and decompressing videos) and not all videos in these formats will work with our player. Fortunately, it's possible to fix such videos. It's also possible to convert videos from a different format into one that will work (e.g. Convert WMV into MP4). While School Loop neither endorses or supports any software for converting videos, we can say that we've successfully used HandBreak, an open source video transcoder. Certainly, there are other solutions that will work equally well. First, download and install Handbreak on your Mac or PC. Once installed, launch the application, then drag and drop your video onto the drop zone. 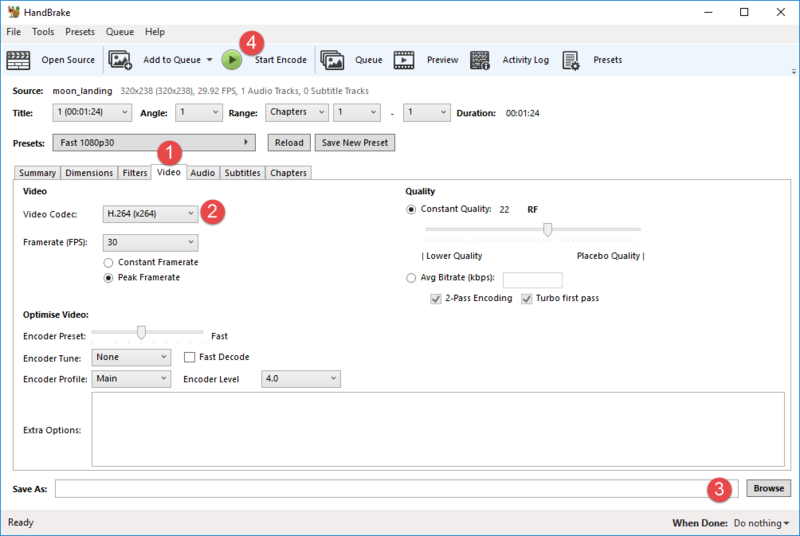 Select H.264 (x264) as the video codec. Click Browse to choose the file name and destination of your converted video. Click the play button to being the encoding process. Depending on the size of your video, the conversion process could take several minutes, so be patient. Once the conversion is complete, upload to the School Loop Video Module.